Olfaction, the science of smell, is one of the least understood of the five senses, which makes odor management a major challenge. Odor perception is subjective and varies widely among individuals. However, odor complaints are routinely received by regulators and government bodies around the United States and internationally. The challenge for any waste treatment facility is to develop a systematic odor management plan that can adequately address citizen complaints in a cost-effective manner. Odors can be quantified subjectively or objectively, using measurable parameters that can be included in regulations or compliance permits (see Table 1). Many state agencies specify ambient odor standards. All of these standards are based on specific compounds, which don’t have a direct correlation with odor detection threshold (DT) values. Odor character – Type of smell, such as citrus, fruity, etc. A facility’s odor analysis can consist of various measurements, ranging from community surveys using questionnaires to measurement of specific chemical odorants, such as H2S, ammonia, odor concentrations of emission sources, and/or ambient odor intensity values. The main goal is to use this odor analysis to develop a systematic plan for odor management. In a typical wastewater treatment plant, odors can be found at influent pump stations (typically hydrogen sulfide or H2S, reduced sulfur compounds or RSC, ammonia); headworks (screening and degritting, H2S and RSC); primary sedimentation basins (H2S); aeration basins (low H2S, volatile organics); sludge storage tanks (H2S, RSC, ammonia, amines, organic acids); dewatering, drying, loading (polymer odors, organics, ammonia); and sludge digesters (H2S, RSC, ammonia, amines, organic acids). Note 1: Under stability category A, the peak 3-minute concentration will be 4.47 times greater than the 1-hour average concentration. An engineer can calculate the air flow rate using an air velocity of 0.5 feet per minute and using the area of the building (in square feet). Maximum air flow rate to the system should be used, such as in the case of an aeration basin, and the exit air draw rate should be figured 10 percent higher than the inlet air flow rate to maintain a negative pressure. For example, if an aeration basin is using 800 standard cubic feet per minute (scfm), then the exit draw rate should be 880 scfm. Ventilation rates for buildings must take into consideration code requirements, including those of the National Fire Protection Act (NFPA). Additional ventilation is needed for systems taken out of service. Higher ventilation rates result in lower concentration, which makes eventual treatment more difficult. The potential for dead spots, corrosion from contaminants, and fugitive emissions increases at lower ventilation rates. Liquid-phase turbulence has a major impact on the gas-phase concentrations. Engineers need to consider the effect of ventilation rates, temperature, liquid-phase turbulence, contaminant’s Henry’s Law Constant, and height of head-space above the liquid to evaluate the exit gas concentration, which will impact the selection and cost of the gas treatment system. Odors can be evaluated on-site throughout the day, through random off-site monitoring, sampling specific odor sources, and plume profiling using air dispersion modeling. In dispersion modeling, puff conditions best mimic potential odor nuisance events. Hourly odor concentrations, as calculated by a dispersion modeling program, can be converted to peak 3-minute odor concentrations using peaking factors (see Table 2). Stability is categorized into six classes -- A through F. Class A (unstable) represents excellent dispersion due to large-scale turbulence, such as substantial vertical and horizontal air movement that allows pollutants to disperse easily. Class F (stable) represents very poor air movement, with low wind speed, little change in wind direction, overcast conditions, and temperature inversions. This condition results in higher concentration of air pollutants, with minimal difference between the peak and average conditions. Table 3. Odor Detection Threshold (DT) values for various concentrations of hydrogen sulfide and reduced sulfur compounds. D/T values were determined by trained odor panel and compound concentrations by gas chromatography. Deriving odor D/T values from concentrations of individual contaminants has several pitfalls. Typically, for wastewater treatment plants, many odor treatment technologies are specified with target treatment efficiencies for H2S and/or RSC. Because each of these compounds has a different D/T value, the D/T values of gas mixtures containing these compounds depends on only some of these compounds. This fact is best illustrated by looking at the D/T values for gas mixtures containing H2S and RSC. Table 4 shows the odor panel measured D/T values for various concentrations of the contaminants. Clearly, even when the H2S concentration is low (high treatment efficiencies for H2S), D/T values remain high due to the presence of RSC. Treatment of H2S alone is insufficient to achieve effective odor control, and hence odor standards and odor treatment systems should be specified based on D/T levels rather than percentage treatment of H2S and/or organic sulfur compounds. Table 4. Conservative range of contaminant concentrations and odor D/T values at various wastewater plant locations with no ventilation rates. 1. Create a list of potential odor sources. 2. Determine the source odor concentration (source D/T values, see Table 4). 3. Using air dispersion modeling and local meteorological data, determine the impact of each source separately at local receptor(s)/fence line using the Industrial Source Complex Short Term (ISCT3, originally developed by the U.S. EPA) dispersion model (Version 02035) and covert the hourly average odor concentrations to peak 3-minute concentrations (see Table 2 for peaking factors). The receptor/fence line goal to be achieved is 10 D/T with an averaging time of 3 minutes. 4. Determine the receptor(s)/fence line deviations from the goal of 10 D/T for each source under various ambient environmental conditions (winter, spring, etc. ), taking the larger value for each source in the ranges. Use the actual measured D/T values, if known. 5. Calculate the Odor Annoyance Index for each source (see Table 5). Table 5. Odor 3-minute peak D/T values calculated at the receptor/fence line locations for a specific odor source (with no controls other than source ventilation) under various ambient environmental conditions. The higher the index; the greater the odor source impact. An engineer then should rank the odor sources in decreasing values, and starting with the largest impact source, develop alternatives for treatment technologies. The three most common methods for determining community odor impact are driving through neighborhoods; sending out community surveys, and reviewing community complaints. A survey can be used to validate dispersion modeling results by comparing them to the model’s predictions. It can be used to identify significant odor sources at the plant and other facilities in the neighborhood. The survey can help identify the region of impact – limited to a few regions, small area of neighborhood, or widespread. Surveys also help identify areas with odor impact but with no complaints, where citizens have learned to simply “accept” the problem. Eventually, surveys can be used for monitoring the effectiveness of an odor-control technology. Surveys can be either mail-in or telephone-based. Mail-in surveys help to record odor events more completely and accurately. However, the percentage return usually is less than 5 percent. Telephone surveys are cheaper to conduct, but they are intrusive, and hence work better by selecting community volunteers willing to answer telephone surveys on a periodic and pre-arranged basis. Several surveys must be conducted in a year to capture the impact of ambient environmental conditions. • Developing recordkeeping. An effective complaint response protocol requires the input of neighbors and other community members by developing recordkeeping of odor events. Selected neighbors and community members can be recruited to participate by recording the strength of odors on a three-point scale: 1 = detectable odor, 2 = recognizable odor, and 3 = distinct and annoying odor. A 24/7 odor hotline and/or an interactive Web-based complaint form can be set up to receive the odor complaint, determine the odor intensity on the three-point scale, and describe the odor based on standard descriptors, such as acrid/pungent, ammonia, burnt, chemical, mold/musty, putrid/rotten eggs and sewage-like. Recordkeeping also can track the frequency of odor events at a given receptor site per month. • Respond adequately to odor complaints, such as sending out an operator to investigate, e-mail complainants regarding the remedial course of action, or explain why an odor event occurred. Some type of response will demonstrate that the plant is listening to its neighbors and addressing their odor concerns. The general philosophy for controlling/treating odor emissions is to try simple methods first. This tactic lowers the total cost of implementing the odor management plan. The exit gas velocity, initially selected to be 3,000 ft/min, is varied together with the exit area and distance S to achieve the desired dilution level. Source control of odors involves covering the source to prevent the emission or chemical treatment (oxidation) of the liquid-phase in the collection system to remove the odor-causing compounds and reduce sulfide corrosion. Physical covers concentrate contaminants inside the enclosed headspace, delay emissions, increase sulfide concentration thereby increasing corrosion inside the vessel, involve capital expense, and makes access more difficult, requiring confined- space entry for repairs. Chemical treatment, if applied upstream in the collection system, can provide odor control and corrosion prevention at several downstream points, such as manholes, air relief valves and re-pump stations. Treatment technologies include addition of iron salts, nitrate solution, oxidizing agents, such as hydrogen peroxide, and chemicals that disrupt the sulfate-to-sulfide bioconversion process. Chemical oxidants such as chlorine, sodium hypochlorite, potassium permanganate, ozone, hydrogen peroxide and ferric salts require on-site storage and handling of chemicals, which causes safety, exposure, and liability issues. They also require metering systems and proper mixing and produce by-products such as precipitates. Air oxidation can be used for odor treatment. Equipment that accomplishes air oxidation includes venturis, blowers, and compressors, but these options have increased operating costs and limited gas transfer rates. Oxygen can be used, although it is five times more expensive than air and requires on-site storage. It also precipitates iron oxide. Oxidizing compounds, such as hydrogen peroxide, are classified as hazardous and are consumed in large quantities because they oxidize everything in the wastewater – biochemical oxygen demand, odorous compounds, etc. Chlorine and hypochlorite cause sulfides to oxidize to sulfate. The ratio of chlorine to sulfide is 8.9 under low pH and 2.2 at high pH. In field applications, the ratio used is 5 to 15, because chlorine indiscriminately oxidizes other compounds. The major issue with the use of chlorine and hypochlorite is the formation of halocarbons from the organics in the wastewater and release of these carcinogenic compounds into the ambient air. Iron salts are specific to sulfides and do not react with other odorous compounds. Ferric salts, such as ferric chloride, react with sulfides to form sulfur while getting reduced to ferrous iron. The ferrous iron reacts with dissolved sulfide to form ferrous sulfide, a light black precipitate. Ferrous sulfide also oxidizes to ferric sulfate in the aeration basin, where it can remove phosphorus. 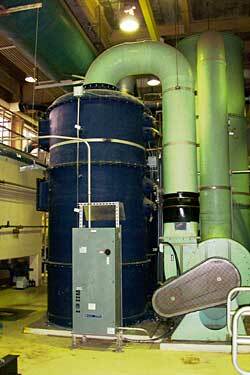 Iron salts are hazardous and require double-wall tanks and piping. Nitrate biochemically oxidizes sulfide to sulfate, which occurs in the bulk flow and on the surface of the slime layer. It is consumed biologically, because it serves as an alternate electron acceptor. Under anaerobic/facultative conditions, fairly high concentrations of nitrate and good mixing are needed to reduce sulfide concentrations in the water. Also, the sulfate formed can again reduce to sulfide under the proper conditions. Enzyme solutions are unique because they biochemically prevent the formation of sulfides. For large wastewater flow rates, substantial volumes of the enzyme solution are needed to disrupt the biofilms and stop the production of sulfides. Point-of-discharge control technologies are activated carbon adsorption, chemical sorbents, chemical scrubbers, and biofiltration. Activated carbon adsorption is simple to use and can be used for adsorbing a wide variety of odorous compounds. While economical at low inlet contaminant concentrations, they are not effective for ammonia and other nitrogen-based compounds. Impregnated carbons have a higher capacity, and some containing metal oxides (referred to as “ash”) can be regenerated with water. Water-regenerable carbons can only be reused a couple of times, since their capacity decreases with each cycle. Large amounts of water and the metal oxides chemically convert mercaptans in the gas stream to disulfides, which sometimes makes the exhaust gas smell worse (higher D/Ts than the inlet D/T). Chemical sorbents react with H2S and mercaptans to form solid products. Sorbents can use organic substrates, such as wood chips, or an inorganic support. Iron oxide sorbents react with H2S to form sulfides, which are oxidized to sulfur, and the oxide is regenerated. The sulfur deposited eventually clogs the system and requires change of the sorbent. The main advantage of these sorbents is that they don’t react with carbon dioxide, an issue with chemical scrubbers using sodium hydroxide. Other sorbents used are potassium permanganate dispersed on porous supports. Chemical scrubbers use a solution of sodium hydroxide and sodium hypochlorite to solubilize and oxidize the H2S and RSC. In multi-stage systems, the consumption of sodium hypochlorite is reduced by first scrubbing with sodium hydroxide to solubilize the H2S and then it reacts with the hypochlorite in the final stage. Chemical scrubbers are costly, require onsite storage of hydroxide and hypochlorite, corrode liquid handling systems, and release chlorine gas. Biofiltration uses either naturally bioactive media, such as compost, soil, or synthetic media, such as randomly packed synthetic material or monolithic media. Compost, soil media systems have a large footprint, eventually require media replacement, and can handle low inlet H2S concentrations. Synthetic media systems are more robust, can handle higher inlet contaminant concentrations, smaller footprint, and higher treatment capacity. The most common media is polyurethane foam, either as randomly packed small cubes or as a monolith, formed by wrapping foam sheets into a cylinder, which is inserted into the vessel as a one-piece cartridge. Biofilters biologically convert H2S to sulfate in the water, which results in low pH within the media. At low pH organic sulfur compounds do not biodegrade, so some systems either use two stages, with fresh water in the second stage to maintain a higher pH or activated carbon for removal of the organic sulfur compounds. Because the inlet H2S concentrations vary greatly, separation between the treatment of H2S and organic sulfur compounds is difficult, resulting in low treatment efficiencies for the organic sulfur species. Foam media tends to plug due to biomass growth, which results in higher gas-phase pressure drop over time. For systems handling higher concentration of organics, foam media would plug due to biomass growth. In systems treating mainly H2S biomass, growth is low due to lack of carbon and low pH. Odor treatment is still an emerging area with different technologies being used, depending on the circumstances. For any facility contemplating odor control, an overall analysis needs to be conducted to develop a comprehensive odor management plan rather than tackling each source as a separate problem. The choice of odor treatment technology is not a matter of one system over another but rather developing a synergism of the various methods, resulting in a cost-effective and manageable system.